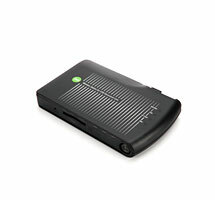 Our latest Presenter has included Wi-Fi streaming support for our wireless products. Please download and install Presenter from here, and launch Presenter after your computer is paired to the WS-01 via Wi-Fi. If you do not see the live image, please go to "Select Video Device" located at the bottom left of Presenter and select WS-01 from the drop down menu. WS-01 does not support USB 3.0 devices. If you are experiencing an USB port failure after connecting a USB 3.0 device, please unplug the device and restart WS-01. Please make sure you entered the network password correctly. WS-01 will not prompt any error message if the password does not match, instead, it will simply not connect. 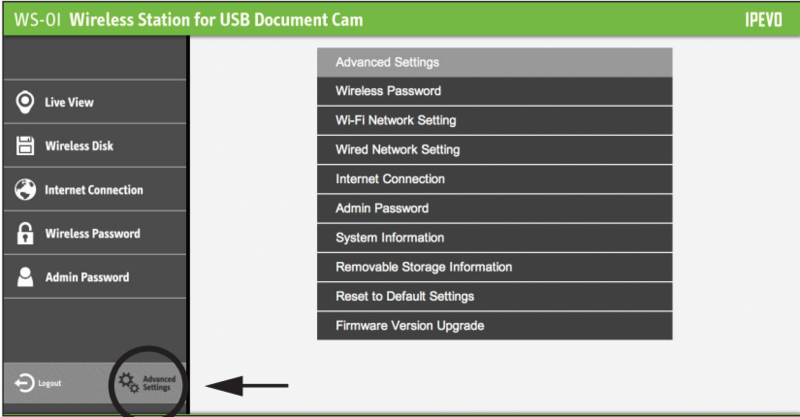 · Make sure your doc cam is connected to the USB port of WS-01. · Make sure your iPad is connected to WS-01 via Wi-Fi. · Shut down the device and restart. · Remove the doc cam and then reconnect its USB cable. · Close and re-launch the IPEVO Whiteboard App. Yes, but charging via a computer's USB port is slower than charging via AC adapter. WS-01's Wi-Fi capability will be disabled when plugged into a USB port and will turn into an SD card reader instead. 1. Access your WS-01 settings page and enter "Advanced Settings." 2. From there, go to Wired Network Setting > Mode > Fixed IP Address. 3. Enter the IP Address, Subnet Mask, Default Gateway and other settings in their respective fields, then click OK. There are more settings under "Advanced Settings" (see picture below). Please consult your internet administrator for advanced settings regarding your network connection. Your files are not compatible with your current iOS/Safari. For more information on what file formats are supported, please refer to Apple's iOS Technology Overview. Yes. But due to bandwidth limitations, it is not recommended to have more than 3 devices streaming video from WS-01 simultaneously. Connecting multiple devices to WS-01 may cause the live view to lag. Use a pin or paper clip to press the Reset button on WS-01 to reset the device. WS-01 will reboot after 3-5 seconds. It takes about 100 seconds for WS-01 to complete the rebooting process. The default network name (SSID) can be found on the label located on the bottom of the device (see picture below), and the default password for Admin is "admin".